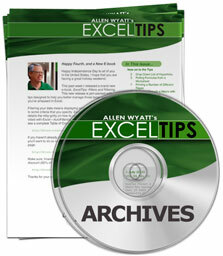 Summary: ExcelTips is a weekly newsletter that provides tips on how to best use Microsoft's word processing software. At the beginning of every year we put together an archive of all the tips published the previous year. Here is the complete table of contents for the archive for the ExcelTips (ribbon) newsletter for the year 2016. Each download item shown below includes the size of the download file. If you have a slow connection to the Internet, you can save precious time by ordering your archives on CD-ROM, instead of as a download.